While TEConomy is U.S. based, we have a global consulting practice that sees our team engaging with clients worldwide. The importance of science and technology to modern economic development, recognition of industry cluster-based economic development to optimize national economic performance, and the need to identify ways to compete in the global economy are just some of the reasons clients seek our expertise. 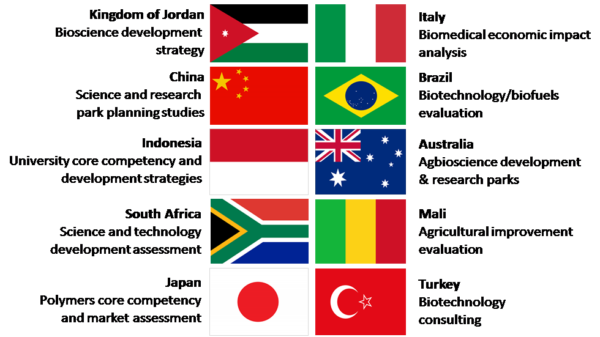 Our international experience is diverse, including projects in both developing and developed nations. We have found that our methods of work translate well into a broad-range of economic and innovation environments. To discuss your project needs and interests, please click on the Contact tab above. Where’s the growth in U.S. academic science and engineering? Specializing in science- and technology-based economic development, TEConomy Partners pays close attention to trends in academe. The following graphic shows TEConomy Partner’s analysis of NSF nationwide data in regards to growth in U.S. academic R&D expenditures (the x axis) and growth in degrees conferred (y axis). The size of each sphere is the total amount of research expenditure in 2014 (the latest year with complete data reporting). 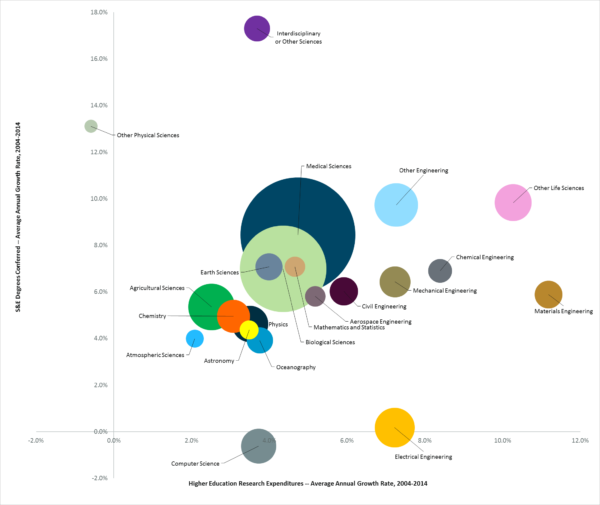 Engineering disciplines have generally experienced the strongest growth in research funding, and have seen quite robust growth in degrees conferred (although electrical engineering is flat in this regard). Life science disciplines, as expected, are in a strong position on both dimensions, and receive by far the highest amount of research funds. Agricultural sciences, however, has seen the third slowest rate of growth. Interdisciplinary science has attracted strong interest from students – something we have also heard in conversations with universities. When talking to industry we also hear a demand for cross-training of students, particularly graduate students, to enable transdisciplinary thinking. Physical sciences have lower relative growth in both research and degrees, something perhaps of concern given the importance of basic science advancements that have underpinned U.S. economic advancement. Computer Science and Electrical Engineering appear to be losing student interest, something that could pose a challenge in our digital economy and the increasingly connected world of the internet-of-things and machine-to-machine (M2M intelligence). It suggests a potential workforce shortage in these important disciplines. With climate change concerns, the comparatively weak position of “Atmospheric Sciences” on both dimensions is extraordinary.